FIRST CLASS. WARM. OBLIGING.At the Crowne Plaza Zurich you feel completely at home.Our four-star business hotel in the fashionable Zurich West district has 365 rooms and is the biggest hotel in Zurich. The hotel features all the comforts and amenities you need for a successful stay in Zurich, whether you are here on business, for a weekend away or a family holiday – with us you are always in the right place! The Superior Rooms designed by world-famous New York designer Tony Chi are brimming with elegance and class. Inviting for both sleep and work. The Crowne Plaza Zurich has 11 conference and events rooms. All the conference rooms have natural daylight, air-conditioning and are equipped with the latest technical facilities. Whether you want to hold a conference, a meeting or a special event – our professional team will provide you with an event that will perfectly match your needs!Indulge in the culinary delights of our fine dining restaurant, Relais des Arts, and the informal LetziLeu. Both restaurants in Zurich offer international cuisine, as well as seasonal and Swiss specialities. In addition, our lobby bar and 24-hour room service are also available. In the summer months, our garden restaurant with its large terrace is an invitation to while away the hours. The extensive fitness & wellness club offers relaxing moments and sporting activities on 2000 square meters.The secure, monitored indoor car park has 550 parking spaces and is located beneath the hotel with direct access both to the hotel and the Badenerstrasse. The car park is open 24 hours a day. Women-only parking spaces, located right next to the lift, are available. Professional. Successful. Attentive.As a conference & business hotel, we have made it our goal not only to fulfil but to exceed your conference and seminar requirements. Conferences, meetings, training courses or workshops – our wide variety of events rooms leave nothing to be desired. 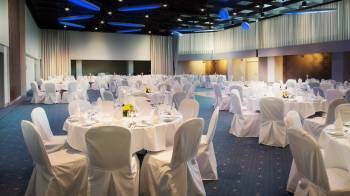 As the biggest conference hotel in Zurich, you can hold conferences of all kinds here with us. Our 11 individual events rooms have natural daylight, air-conditioning and the latest technical facilities as well as wireless Internet access. The Crowne Plaza Zurich Events Team is available to provide you with practical support and advice.